If you’ve ever eaten a whole bag or pack of food only to realize it once all the food was gone, you’ve experienced mindless eating. When this happens regularly, this kind of eating can lead you to eat much more than you need and make you gain weight. 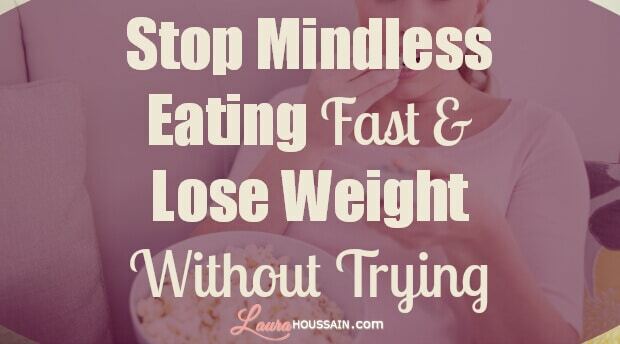 Let me show you simple techniques you can use today to stop mindless eating fast. It may seem simplistic, but if you allow yourself to eat only when sitting at a table, you’ll eliminate eating at the movies, on a coach, while driving…. I’m French and if you’ve ever been to France, you’ll know that French people take food really seriously. Food is an art, a passion, something precious. We don’t take eating casually, or not so much. We tend to eat food at a table with all family members at the same time. There is not a lot of munching and snacking in between meals. If you’ve got to have something to eat mid-afternoon, do like the British used to do. Eat crumpets with tea but for goodness sake do it sitting down and chatting with a friend. This may take some time, but if you manage to eat only sitting down at a table without doing anything else that eating and chewing your food, I can assure you, you’ll either notice that you have an overeating issue or will just start losing some weight. In either case, we’ll place you one step closer to weight-loss. When I lived in New York, I used to have a roommate who was a power multi-tasker. She could watch TV, do abs and learn Hebrew, all at the same time. That woman never ceased to amaze me. Unfortunately, her innate ability to do several things at the same time worked against her in terms of weight loss. She hardly ever sat down and took a break to eat. She never chewed her food. That caused her quite a few stomach problems. Worse, she didn’t even realize how much she was eating and had no idea of how hungry she felt. That used to confuse me a bit because I was raised thinking everyone sat down to eat. Eating is a time when you nourish your body. You need your body to function well in order to have energy. Make it a priority. When you eat, do just that. That means no watching TV or being on the phone, or putting the laundry in the washing machine. If you have to eat in the car because you’re on the road, pull over, stop and take the time to chew. Feel your saliva mix with food in your mouth. Appreciate all the flavors before you swallow. Humans are creatures of habit. If you make a habit of eating at certain times and not outside of those times and apply both previous tips, you will never eat mindlessly again. It’s that simple. You eat mindlessly because you haven’t created routines that condition your mind and your brain to nourish yourself, you have conditioned it to make eating something you do to entertain yourself in some way. Now that you know what habits you must develop in order to stop eating mindlessly, let me show you how to break your old mindless eating patterns. Let’s imagine you have been eating on your sofa in front of the TV every night for several years. You are trying to follow my tips to stop mindless eating and you have decided to eat only at the table at dinner time while doing nothing else. Bravo! Unfortunately, your brain is used to eating in front of the TV every night. Not only that, but probably eating sweet and fatty food that releases those “pleasure hormones” your brain loves so much. You sit in front of the TV empty handed. All of a sudden, you start feeling uncomfortable. Something is missing. You don’t know why, but before you know it, you rush to the kitchen to grab something to eat during a commercial break. Now, you feel better, but you have just returned to your mindless eating patterns. I don’t know if this scenario sounds familiar, but it looks very much like what my former roommate used to do. She would make resolutions but would return to eating anywhere, anytime just because she needed something in her mouth..
That’s why I don’t feel I’ll have fully helped you if I don’t show you how to break your old eating habits. Sit down on your sofa with some food next to you. Switch off the television. Please adapt this method according to your own habits. Now I want you to think of the long-term consequences of your mindless eating issue. For example, loss of control. Loss of control over what you eat and what you weigh. For me, one of the consequences was the rotten teeth that eating so much sugar had given me. Now I want you to experience that long-term scenario as if it were happening now. All you need to do is to make up your own TV show in your head and add bodily sensations to it. How will your body feel? How will your relationships suffer? How will you feel about yourself? How will you look? Make it as real and as painful as you can. Tap into your deepest fears and blow them up. Increase the intensity of your sensation. Make the image bigger, brighter. Increase the contrast. Try anything to make this movie as intense and as unpleasant as possible. Now, imagine yourself eating your favorite snack on the sofa as usual but make this movie go very slowly. First grab some food and as you move your hand towards your mouth, see your body transform, your relationship, your self-image move as if you were experiencing in the present the very same thing you experienced in distant future in the previous paragraph. Now, imagine yourself eating your favorite snack on the sofa as usual, but make this movie go very slowly. First grab some food and, as you move your hand towards your mouth, see your body, your relationship, your self-image transform as if you were experiencing right now the very same thing you imagined yourself experiencing in the distant future in the previous paragraph. What you’re trying to do is to visualize the consequences of your actions. You can keep on denying that your habit is making you gain weight or is likely to do so – or you can just face the reality of things. Now let’s retrain your brain one more time. Close your eyes again and try to breathe as deeply as you can without effort. Now, see yourself on the sofa eating some food, but don’t physically touch any food. Now, as your hand is reaching for your mouth, see yourself getting fat and, if you eat sugary food, see wrinkles forming, see your teeth get rotten or anything that really triggers fear and pain. Make the feelings, sensations, images and sounds as intense as possible. Open your eyes. Stand up. Shake your body a little. Turn your head left and right and sit down again. If you practice this exercise while waiting on line, each time you’re on the sofa and any other time you get the chance, you’ll make mindless eating very unpleasant. This technique is simple, yet when combined with the tips above, it’s one of the best ways to stop mindless eating permanently with ease. I used this method to stop smoking without any cravings and I haven’t smoked for years. Your imagination will always beat your will-power so use it to your advantage, not against you. Instead of fantasizing about when you’ll eat that comforting food in front of the TV, imagine the worst consequences it will have on your life. That’s simple and it works. I hope you’ll give it a try for at least 21 days. Let me know how it goes in the comments below and if you haven’t subscribed to my newsletter, please do so now. You’ll get a fabulous training video to help you stop any craving at will. Enter your name and email to start taking control. Seriously I’m inspired by your post.